Have you ever thought about creating a blog or any portfolio website that looks similar to a real life magazine? With the availability of a large number of magazine related WordPress themes out there, it is difficult for the webmasters to choose the best one. To help out these webmasters, the MH Magazine WordPress theme is launched into the WordPress market. This theme is an ideal choice for any website that wants to share information on latest happenings and breaking news across the world. The elegant and minimalistic design of the theme makes your website look like one of the few big players in the online news market, such as CNN, MSNBC, New York Times and Fox News etc. This editorial related WordPress theme comes with a bundle of widgets and shortcodes that allow the theme users to easily access and change almost everything on the website with just a few clicks. 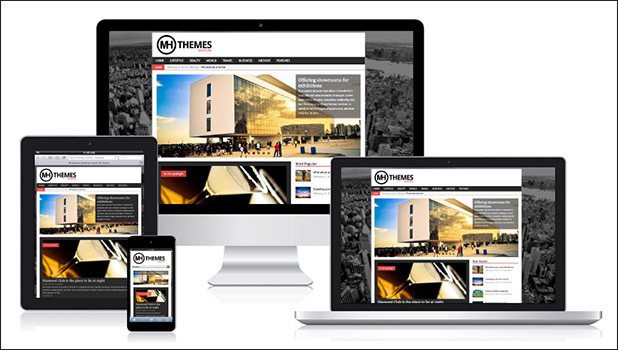 The MH Magazine WordPress Theme features a fully responsive design, due to which the entire content and graphical elements presented on the webpage will adapt on all browsing devices such as iPhone, iPad, tablet, desktop computer and laptops. This professionally crafted WordPress theme comes bundled with various useful and standard features that include built-in SEO features, useful shortcodes, colorpickers and a wide range of custom widgets and custom templates. Users of the MH Magazine WordPress Theme can easily access the theme’s options panel to customize or modify almost any portion of the theme, until it matches their individual or business requirements. The features that make MH Magazine WordPress Theme to stand out as one of the best magazine themes are highlighted below. • The entire theme is crafted by following the WordPress Coding Standards. • It is translation ready, so the theme can be easily translated into the local language of the webmaster as the theme includes .po and .mo translation files. • There are a lot of widgets and templates available, which makes the theme very flexible in terms of layout and intended use. • MH Magazine is SEO optimized and has included some very useful SEO features. Usually no additional SEO plugin is needed. • Due to the several widget areas, it is very easy to add advertising to your website. • The theme has built-in social sharing buttons that provides direct linking to Facebook, Twitter and Google+. • Users can add custom backgrounds, set featured images and upload a logo by accessing the theme’s options panel. • The built-in colorpickers enable the theme owners to craft their own color schemes. • By installing the popular Contact Form 7 plugin, users can create a custom contact form and paste it to their contact page. The theme will automatically take care of the CSS styling. • The theme is cross browser ready (IE8+, Chrome, Safari, Firefox, Opera) and supports mobile devices due to the responsive layout. To make a difference with your magazine website, you should try this professional looking MH Magazine WordPress Theme.